In 2011 I found a book by Stephen Shapiro named “Goal-Free Living.” The book intrigued me a lot, and I even wrote a post, assuming that the author didn’t mean that all goals should be thrown into the trash. Such a thing would be too radical. I thought that the book would most likely talk about tweaks in working with goals. But I was finally able to read the book and was surprised to find that Stephen really did oppose the classical goal-setting approach. He instead used goal-free techniques, in which “goals” became “aspirations,” and “action plans” became an “intuitive compass.” On the surface it sounded pretty revolutionary. However, the more I read the book, the more I saw similarities with other ideas I’ve seen elsewhere. I found the strongest association between Stephen’s book and another book by Dr. Beverly A. Potter with the long name, “High Performance Goal Setting : Using Intuition to Conceive and Achieve Your Dreams.” The answer popped up almost immediately--it seemed that Stephen was really only talking about an intuitive approach to goal setting! The substitution of common terms with new ones confused me, but not too much. He was only trying to present his own ideas as something new. There were some ideas that I’d never seen before, but there was no true revolution. Stephen just looked at goal-setting from a different angle, complementing it with his approach instead of actually contradicting it. Over the years, the dominating approach to goal-setting has always been based on the clear and elaborate definition of goals, action planning, and the critical analysis of results. This method can be heard from the majority of trainers and be read in numerous books. As more people have accumulated experience with goals, though, it has become apparent that these rational methods of goal-setting are not for everyone. In the beginning of his book, Stephen showed some interesting statistics. He demonstrated that more than half of all people who practice goal-setting do not achieve their desired results, but rather raise the amount of stress in their lives. I have to admit that I was mostly focused on the rational approach. My main objective was to automate management, and automation, using modern computer technologies, is easier to accomplish with rational goal-setting than with intuitive. After reading Stephen’s book, I decided to figure out how the two approaches relate to each other. A solution appeared right away. I just had to remember that people have different abilities in abstract thinking, analysis, and math. Those abilities, as modern research shows, depend on which of the two hemispheres of the human brain is the dominating side. People with a dominating left side use analytical thinking and are more inclined to operate with facts. People with a dominating right side, however, belong to a more synthetic type. They most often operate on emotions and are more inclined toward a holistic perception of reality, looking more at the big picture of life and less at the smaller details. As you can see, for right-brained people the picture of modern goal-setting is not pretty. One way or another, our society imposes approaches on them that do not suit them well. By following the currently advertised methods, they set goals for themselves, spend their lives on trying to reach them, and then fail at the end. Individuals with a dominating right side get into a conflict with their own nature. Furthermore, because they are unable to accurately define and structure their feelings, they sometimes tend to copy goals from somebody else. They go after these goals, following a correct way that doesn’t match their actual situation, and receive generally negative results. Also, even when the adopted goals are achieved, since they are alien to the adopters, they don’t bring the satisfaction that was desired. Defined, measurable, limited in time, an endpoint of activities. It is achievable, but requires one to stretch and to leave his/her comfort zone. Results are described as a set of well-defined measures. Attraction point in the future, which generates desire and inspires one to reach it. Often it is perceived ideally and cannot be completely achieved. Results are presented as mental pictures. Well structured, thought-out, analyzed plan. Actions are rational and planned a few steps ahead. Risks are evaluated and minimized. There are no plans. All actions are intuitive, even impulsive. Decisions are made only for the next step depending on the situation. Risky behavior is welcome--everything that could happen is for the better. Set your goal, plan your path, and follow it, overcoming all obstacles. Become a flow, which goes into the direction of your aspirations. Based on facts, analysis, and detailed and structured information. Obstacles are expected and overcome by rational efforts. New opportunities are found via a periodic reevaluation of the situation. If a human being has only two hemispheres in his brain, does it mean that there are only two approaches to goal-setting? In reality, both approaches--rational and intuitive--belong to so-called “cognitive” (conscious) methods. There are other goal-setting methods, which are based on manipulations of the subconscious mind. Shamanism and witchcraft, meditation, religious practices, NLP (neuro-linguistic programming), and many other methods are able to predefine and direct human action at a deep level, without touching the cognitive mind. Their use is limited to typical patterns, though, and shifting away from those patterns can result in unpredictable circumstances and is practiced only by specialists. Those practices still require good research before they can ever be practical and efficient tools for regular people. The last point I’d like to make in this post is related to goal-setting in groups and organizations. If an individual sets and reaches goals alone, one style would be more than enough. However, the practice of doing so shows that the one-sided approach in group goal-setting is ineffective. If goals are set using a rational approach, they are usually perceived as firm instructions to follow with no room for creativity and individuality. In this case, the involvement of group members is relatively low, and their potential, especially that of creative people with a dominant right side, remains underutilized. On the other hand, if goals are defined intuitively as a vivid but undefined picture, then every team member may understand the goals differently. As a result, their actions pull the group into different directions and the overall positive effect is minimal. To make group goal-setting more effective, combined methods should be used. In doing so, goals should be presented colorfully to stimulate emotions, and at the same time be discussed, key points written down to synchronize the visions of all group members. Action plans should then be set up as clear steps with delegated responsibilities, but should not fall into micro-management. Giving more freedom to every player will allow them to do the work in their most convenient and efficient way. By incorporating both methods of goal-setting, the group will reach better results and higher satisfaction. In literature you can find two typical leadership styles: charismatic and organizational. It is obvious that charismatic leaders rely on a right-sided, intuitive management style with vision and ideals. On the contrary, organizational leaders use a left-sided, rational approach with clear structure and deep elaboration. However, in many cases successful leaders cannot organize and lead a big group of people just by themselves. In order to do that, they need assistants to compensate for missing parts. Thus, in organizations, charismatic leaders need rational and logical assistants, who will transform their visions into clear action plans and execute them with all available energy. Organizational leaders then need the other type of assistants--idea generators. They can then take their ideas, structure them, and effectively implement them using available resources. In all things, balance is needed. Where there is a right brain, it is good to have a left brain. Therefore, in an organization, it is best to use both rational and intuitive goal-setting. 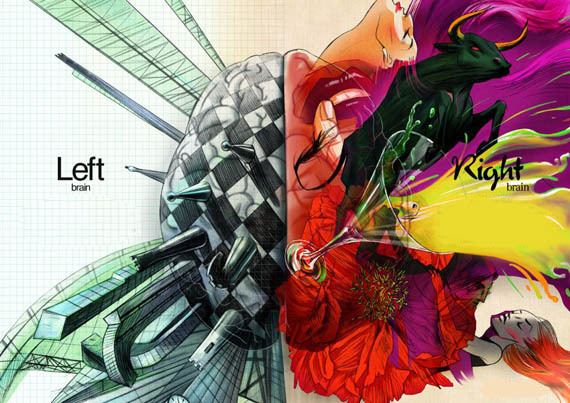 Тест - Are You Left or Right Brained? The first step in working with any system is to understand it by starting with its description, which can be expressed in a formal or informal manner. A model, which is an abstract formal definition of a system, can be very helpful. It describes a system’s structure and behavior and can be represented by several interrelated views. In this post, we will look at a general approach to modeling goal-oriented systems and the reasons behind doing so. Below are two of the most typical methods of modeling and improving models: the reengineering of business processes, and comprehensive management automation. The original model is improved to solve particular business problems--to optimize management processes, to minimize resource utilization, to maximize productivity, etc. The improved model is deployed and then transforms the management system. Similar to reengineering, the original model is improved since automation may significantly change various management processes (and there is no reason to drag the rudiments of manual management into the new world). Next, the new automation system is added to the business model and linked to its functions, information flows, and other elements that will be automated--and their quantitative and qualitative characteristics are elaborated. The new model is called requirements as it defines what the automation system will require. Based on these requirements an architecture is created, which is also a model. It describes the structure of new automated solutions, the system’s decomposition into subsystems and components, the component’s functions, and processed information. The requirements can also be used to generate test cases to verify that the automated solutions do what they were intended to. Based on the architecture model, automated solutions are then implemented and finally deployed throughout the organization. First, there are Systems (S) and Environments (E) that are broken down into Subsystems (SU) and Subenvironments (EU), which can all be called Contexts (C). Contexts allow designers to split a large model into smaller logical parts, which can be defined separately without losing connections with the whole. Then there are Elements (E), which compose the system and environment, their relations (ER), and the parameters (EP) that define their state. Active element (RA) or Decision Maker (DM) - An element role that is actively involved in management. It is able to perform management functions, receive and reach goals, make decisions, and take actions to change a system and/or environmental state. For example, a digger, a driver, and their customers and supervisors are all active elements. Resource (RR) - An element role that required for specific management functions, but is not able to perform functions by itself. For example, a shovel is resource for a digger, and fuel and vehicles are resources for a driver. Subject (RS) - An element role on which the actions of active elements are directed. For example, a piece of land is a subject for a digger, and loaded vehicle is a subject for a driver. Group (composite) element (RG) - A group element role. 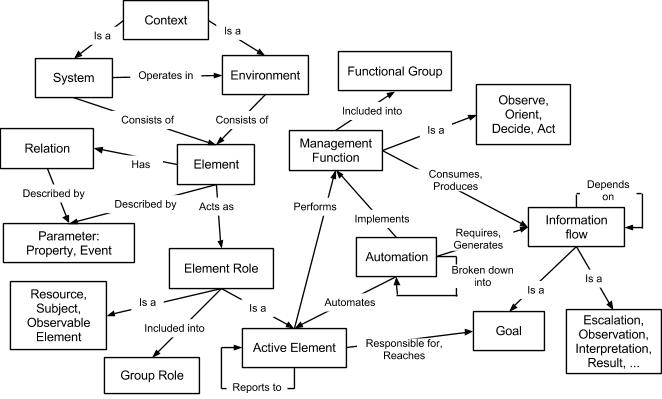 Such a role is useful for the recursive decomposition of a management system. It may represent a division, department, or group as a single super-element and can be broken down into smaller and more specific roles. Observe (FB) - Functions that obtain initial data (basic facts and observations). Orient (FO) - Functions that interpret the obtained data to generate facts useful for decision making. Decide (FD) - Functions that make decisions based on higher-level goals, current situational information, and knowledge about the system structure. Act (FA) - Functions that perform actions to change a system and/or environmental state, or that delegate actions to subordinate active elements at lower management levels. Finally, it is also good to consider Functional Groups (FG), which can be repeatedly broken down into lower-level and more specific functions. Goals (IG) - what must be achieved in the management process by active elements. Actions (IA) - information on what has to be performed to execute set goals/plans and to change the system and/or environmental state. Based on principles of dualism, actions represent an elementary goal at a certain abstraction level. They show an endpoint in the management flow. Also, they cannot be broken down into smaller goals, while goals can be. Escalations (IE) - signals alerting that set goals cannot be reached in the way they were defined. Escalations are typically transmitted in the opposite direction of their related goals. Interpretations (II) - various facts required for decision making. Interpretations represent the most common form of analytical information. Observations (IO) - initial basic analytical data. Based on principles of dualism, an observation represents an elementary interpretation at a certain abstraction level. They show a starting point in the analytical flow. Additionally, as they’re based on initial data, they cannot be broken down into simpler interpretations, while regular interpretations could be. Results (IR) - interpretations (including observations) which can be directly linked to specific management goals. Results are used in the feedback loop of a management system. Information about System Structure (IS) - represents information about the structure of a system and environment. Automated Systems (AS) - automation solutions which are separately developed, purchased, and installed. Automated Subsystems (AU) - parts of larger automation systems which could be broken down into smaller components. Automated Components (AC) - elementary, indivisible parts of automation systems. It looks like a big mess, doesn’t it? Ideally, a GOMA model will be defined with extremely high precision and details, so it can be sufficient for the design of comprehensive automation solutions--solutions that will completely replace humans in management systems. Obviously, if such complex models are visualized in a single plane, it will be practically impossible to read and understand them. That’s why GOMA models use a number of interrelated graphical views (diagrams). I’d like to emphasize that the diagrams in GOMA are not models. They are just views of a model to visualize it from a specific angle. Any change in a model shall trigger changes in the diagrams, which will contain the updated elements and relations between them. I’ll give you more details about different types of diagrams in my later posts. Lastly, I’d like to mention the possibility of formally transitioning between different types of models. 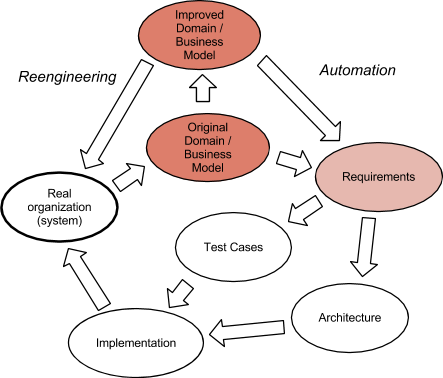 In the figure below, we can see the evolution of a model from a Domain/Business model to a Requirements model and finally to an Architecture model. 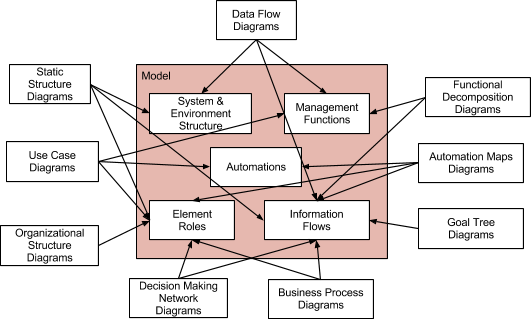 The Domain / Business model defines a system before automation. It describes the system’s structure, element roles, management functions, information flows, and the relationships between them. The quantitative and qualitative model characteristics, required for automation, are elaborated. Hopefully, this article has helped you to see the better benefits of GOMA modeling. Though complex, it is much easier to understand than the other typical methods of modeling. It helps us to better understand management automation systems. In the post “Goal Acceptance by Different Groups of People,” I described 4 categories of people in relation to how they perceive goals and goal-setting. Through that post, it was found that only two categories out of the four (innovators and dreamers, which make up less than 20% of the population), have an inclination to think positively about goals. The vast majority of people look at goals either neutrally or sometimes aggressively. Lately, I had to take a close look at that problem to understand how to involve all categories of people in the goal-setting process, what tools to give them, and how to help them become more effective and motivated people. During this examination I came up with an interesting model that I’d like to share with you. The first idea that came to mind was that it’s pretty useless to try to change people’s perceptions of goals. A goal by itself doesn’t represent anything special. It is just a navigation tool--a method to move throughout life. Therefore, I thought it would make more sense to start looking at how different people perceive their life in general. 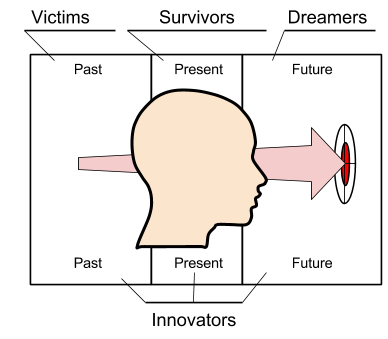 The second idea was that a person’s life consists of his or her past, present, and future. Goals are just road marks, attraction points in the future. The reaching process happens in the present, and all of that is based on events and experiences from the past. Victims. I’m not a professional psychologist and can be wrong here, but it seems to me that victims are mostly focused on their past. More precisely, their life is loaded with baggage full of past negative events that happened to them or around them. Because of that, they feel unhappy, frustrated, and oppressed. In such a condition they can’t take full responsibility over their own decisions and actions, they can’t find comfort in the present, and that can’t take steps to improve their future situation. Survivors are focused on the present. Most of the time they feel relatively comfortable and stable. Survivors are pretty happy with what they have, and can be satisfied with less. Only a strong reason--a serious problem or a great desire--can make them change and move. Then, as soon as the situation becomes good enough, they find a new comfort zone and stay there until the next strong motivator. Dreamers live in the future, filled with dreams about their great ideas. Neither the present nor the past have any real significance. The present is just a waiting period before something much better, and much greater, comes along for sure. Without a stable grounding in the present, dreamers can’t effectively reach their dreams or enjoy their possible success. Eventually their waiting turns into frustration, their current idea is thrown out, and another wonderful dream comes to the forefront. Innovators, as it was stated before, represent the minority but the most fruitful part of society. They feel confident in all three areas of time. The past for them is not a heavy load, but is instead a warm memory with the steps towards a great journey; the present is relatively stable and pleasant, but not enough to cause them to stay there forever; and their future has specific attraction points, which give them the strength and direction to change and move forward. By having a stable base in the present, they are able to use the available resources and opportunities to reach their goals. With those definitions, I then went on to think about how the various categories of people could be motivated towards the most effective and balanced innovator state. Victims, of course, have to leave their past in the past. They have to try, at least, to forgive themselves and others for all the bad that happened. At the end of the day, everything that doesn’t kill us, really does make us stronger (as long as we are able to learn positive lessons from it). They then have to accept themselves as they are, understanding and appreciating their own uniqueness and value. From this point, the next important step for them is to accept responsibility for their own actions. Doing this can help victims reach the survivor level and then keep moving forward. Survivors. Their problem is located in the absence of significant attraction points in the future, which could make extra work and effort worthwhile. In order to break that balance, their position must be altered. This could be done by showing them that they could look healthier, live a longer and more comfortable life, make more money, and enjoy the respect of the people around them. Often, the necessary shift could be presented by pointing outside of a person: a desire to provide a better live for a loved one or family, to make a significant contribution towards a company’s success, or to change the entire world for the better. In doing this, it is important to emphasize that all of these future points are within reach without making super efforts. The presence of well-defined information, proven know-how, and the support and encouragement of a group may also play positive roles here. There is a paradox, I found, that many goal-setting methods preach success building but rarely lead there in practice. As I see it, the problem is that most of them focus too much on the future, and pay little attention to the past and present. Following their instructions, people may force themselves into the dreamer category. They either get into a conflict with their current natural category, or switch entirely into the dreamer mode with all of its bad consequences. In order for all categories to become more effective and motivated towards goal-setting, the practices above should be applied. The Soviet Union created an extremely effective machine to oppress human individuality. From the marxist theory’s point of view, the entire world is divided into the oppressors (business owners) and the oppressed (their laborers). The national ownership of property eliminated small oppressors, but it transformed the state into a monstrous oppressive machine, from which no one could be saved. Effective police forces then cemented that model and made it almost impossible to change. All of that turned large masses of people into mental victims. Now, the Soviet Union could rule those victims easily, but, because victims almost entirely lose their abilities to move on their own, the Soviet Union had a lot of trouble. In my opinion, this is the key factor that led to the stagnation and collapse of soviet society. In India, we can find an interesting example of a countrywide survivor model. Historically, India created a caste system which demanded: “Accept your fate as it is, and, with the next lives to come, perhaps you can hope for more.” Many millions of people, living in horrible poverty, accepted their fate and lived as best they could, never making any attempts to change anything. Such a model is extremely stable and can remain unchanged for thousands of years. However, any significant improvement there will also be nearly possible. The dreamer model can then be found in Asian countries which have made fundamental Islam a countrywide government religion. The triumph of Islam in the world and the fight against infidels has become an all-consuming goal. The present has almost no value, as value can only be found in the Islamic pastures of Heaven where holy dreamers go after their death. Reaching satisfaction during one’s lifetime is incorrect, and even forbidden. Obviously, such politics create a very mobile, aggressive society, which has a terrible destroying power. Finally, Western countries, and especially the US, have implemented the most balanced approach, focusing on the production of innovative individuals. It is this, not democracy, that explains their quick progress over a short historical period of time and their current dominating role in the world. The value of human life, tolerance, and the consumer market emphasizes giving respect to an individual and his or her needs. High life standards and social programs create comfortable living conditions for most members of society, which raises them from victims to survivors, and then high social mobility, an innovative economy, Hollywood standards, and the American dream form attraction points in the future and give people goals to aim for. As a result, more balanced individuals are formed with a high percentage of true innovators. This mass of people becomes the key driving force behind Western society and creates improvements in cultural, economic, military, and other areas. From these examples, we can see that countries that support innovators and innovation have made the most improvements to society.